Performing arithmetic operations on algebraic representations of polynomials, factorizing and expanding appropriately when it helps to make the operations easier. In this lesson students make connections between representations, clear parentheses, simplify, factorize, and use the arithmetic of polynomials in a purposive context. Before the lesson students work individually on the Sequences and Equations task. You review their responses and create questions for students to consider, to help improve their work. You introduce the lesson by showing students how the card matching activity works. Students then work collaboratively in small groups to match diagrammatic and algebraic representations of polynomials, displaying their work on posters. Students share their finished posters, comparing reasoning and checking that explanations are clear and complete. In a whole-class discussion, you reflect on the strategies students have used to complete the task. In a follow-up lesson students work individually to review their solutions to the initial assessment task before completing a second task, Sequences and Equations (revisited). Each student will need a copy of Sequences and Equations and Sequences and Equations (revisited), a mini-whiteboard, pen, and eraser. Each small group of students will need the cut-up card sets Sequences of Dots and Adding Polynomials, a large sheet of poster paper, a glue stick, and a pencil. 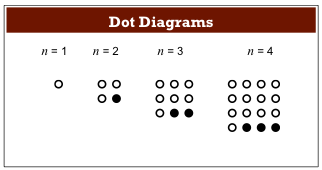 Students needing an extension should be given Card Set: Blank Cards to create their own sequences of dots with algebraic expressions. Approximately 15 minutes before the lesson, a 75-minute lesson (or two 40-minute lessons), and 15 minutes in a follow-up lesson. Exact timings with depend on the needs of your class.